Great hostel, very friendly staff and comfortable beds. Super friendly staff. Very helpful. Five minute walking distance to the bus station. Grocery store less than a block away. Within 20 minutes walking distance of the majority of all the main sites that you will want to see in Belgrade. My room was quiet and the air-conditioner worked really well. Also good Wi-Fi. I would definitely stay there again. Excellent staff and very friendly and helpful. The night guard couldn’t speak English and didn’t understand what we were saying. We had booked a double room and were put in a 5 bed room but no one else was there. (This also because the night guard didn’t know where to put us) The staff at the counters were so helpful! Extremely friendly! Everything else about the place is fine. Maybe their prices are too much for the place. Shortest walk across the road to main bus station. Longer walk to main part of town. Value for money. A good choice if you look something for one night, close to the bus or railway station (yes, it is VERY close to the bus station, just a few steps away). But it is not the coziest place I stayed at in Belgrade. The private room we had was quite O.K, the cleanliness of the bathroom could be "optimized". Okay, technically I actually didn’t stay here. The reason being when we arrived they informed us that they had double booked our room. We were not impressed. However, the guy in reception was super helpful and found us a different place to stay called ‘Pop Art’ it’s in the same building as Jasmin. This hostel was much nicer and the guy who runs it was really helpful to us as our airline had lost our luggage. 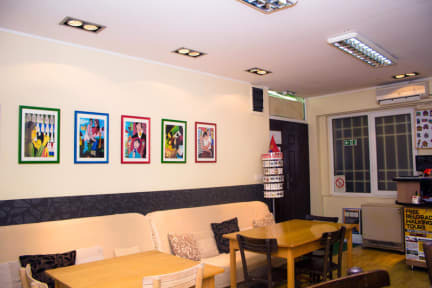 Overall, booking with this hostel is risky but the staff are very helpful. Clean and good location but avoid if possible. 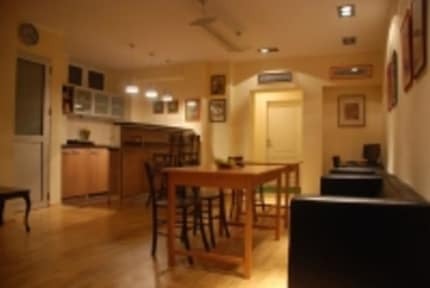 Small hostel with one common room dominated by a few grumpy old Serbians (staff? Family?) Who speak little to no English and sleep on the couch day and night... Going to the toilet during the night means walking past the old guy on the couch and turning the bathroom light on, who proceeded to talk at me aggressively in Serbian... Saw only one other person possibly staying there that avoided eye contact. Seems to be more for Serbian guests.